On February 21, 2011 the New York Times had an article about the decaying infrastructure of some of the 85,000 dams on rivers in the U.S. According to the Association of State Dam Safety Officials, more than 4,400 are considered susceptible to failure for various reasons. The cost of repairing all of these dams would be billions, money not freely at hand in this fiscal climate. As far as I can tell, this does not include privately-owned dams, of which there are a significant number. The "Great Flood of 1889" in Johnstown, PA, was the result of the failure of a privately owned dam. In that case, a group of speculators had purchased an abandoned reservoir to convert it into a recreational lake for the wealthy associates of Carnegie Steel of Pittsburgh. The South Fork Fishing and Hunting Club became an exclusive retreat for 50+ Pittsburgh industrial tycoons. A major storm deluged the region with 6-10 inches in 24 hours, causing the dam to fail, resulting in 2200 deaths, surpassed only by the 1900 Galveston hurricane and then the 9/11 attacks. According to the WCD, a "large dam" is 15 m high or more from its foundation, and any dam between 5-15 m in height that has a reservoir volume of more than 3 million cubic meters is also a "large dam." By this classification, there are more than 45,000 large dams around the world. These dams provide growing populations and economies with water to be used in many ways. Many of them are on rivers that are subject to disputes amongst neighboring countries who argue over water rights of rivers on their boundaries. Competing needs amongst agriculture, industry, and municipal uses continue to draw on a limited supply of water. The causes of concern about aging dams are numerous. In some cases, new information has come to light about the geologic setting, e.g., an unknown fault discovered. There is danger of internal seepage, or of overtopping if extreme floods occur. 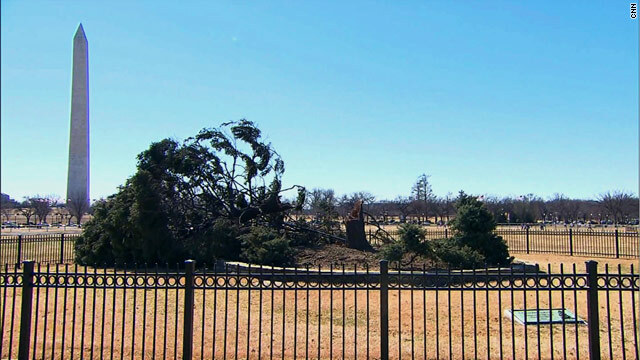 There have also been decades of accumulation of knowledge about environmental effects that range from induced earthquakes to habitat destruction. Interestingly, the World Commission on Dams report focuses to a large extent on documenting past expectations and performances of dams, and dam building practices. I could find relatively little dealing with the problems of maintaining infrastructure on the century time-scale. Perhaps someone can help? Are deep waters ultramarine blue? Artists impression of an S3- molecule in a diamond cell. Aside: Dave Petley has updated his landslide blog with excellent coverage of the conditions in Christchurch. Sulfur is a key element in the transportation of gold in hot water geothermal systems. Although there are a number of forms, the most common are sulfide (sulfur in a -2 oxidation state, hydrogen sulfide, H2S) and sulfate (SO4, in which a sulfur ion in a +6 oxidation state is surrounded by four oxygens in a tetrahedron). It has been difficult to characterize the chemistry of the hot aqueous fluids because rates of reaction are too fast to allow the hot fluid to preserve its chemistry upon cooling. Attempts to deduce the chemistry by looking at fluid inclusions trapped in minerals have been frustrated by these reactions, and reveal almost exclusively sulfate and sulfide. In a paper in the February 25, 2011, issue of Science, (vol. 331, p. 1052), Gleb Pokrovski and Leonid Dubrovinsky used Raman spectroscopy to examine the species in situ in a diamond anvil cell at temperatures between 25 and 450 C, and pressures of 0.5-3.5 GPa, temperatures and pressures characteristic of hydrothermal systems. They found that sulfate and sulfide were the dominant species at temperatures less than 250 C, as expected, but that at higher temperatures the dominant form was trisulfur, S3-. It was identified by S-S bending and stretching modes at characteristic wavelengths in the Raman spectrum. Combined with known thermodynamics, the data allowed them to predict the S3- concentrations in natural fluids, they calculate that in a 1 wt% S concentration, the S3- accounts for a major part of the dissolved sulfur over a wide range of conditions of pressure, temperature and pH. S3- forms at the expense of sulfides and sulfates, and thus reduces the amount of sulfur retained in deposited minerals such as pyrite, pyrrhotite, anhydrite and barite. It increases sulfur mobility by preserving it in the aqueous solution. It binds well with gold, copper and platinum, and so competes with sulfide and sulfate as a transporting agent for these elements at depth. Upon rising into lower pressure and temperature environments, it will decompose into sulfate and sulfide, resulting in precipitation of the gold. It may rise high enough to form a low-density vapor phase. Finally, Pokrovski and Dubrovinsky conclude that if S3- is as abundant as they predict, it will influence the thermodynamic properties, kinetic models of reactions, and sulfur isotope-fractionation models which ignore its formation at this time. In an accompanying perspective (p. 1018), Craig Manning discusses the role of S3- in mineralogy, specifically the role of it in giving lapis lazuli it's deep blue color by charge transfer between groups of S3-. Because sulfur has such different oxidation states (6+ and 2-) changes between these states leads to the transfer of many electrons. These transfers can lead to oxidation or reduction reactions in host rocks. He notes that in the 1991 eruption of Mount Pinatubo more sulfur was degassed than could be accounted for by the chemistry of the parent magma. The simplest explanation is that there was a sulfur-rich vapor phase deep in the volcano that was carried upward in the eruption, and that much of the SO2 released could have formed from precursory aqueous S3-. Manning concludes with the intriguing thought that deep waters may be ultramarine blue, an old idea dating back to 1856, revived by by Walter Giggenbach in 1971, but attributed to S2-, not S3-. "Then I saw the rockmass jump away from the ledge. The lower part of the block was squeezed by the pressure of the rapidly falling upper part, became disintegrated and burst forth into the air. .. 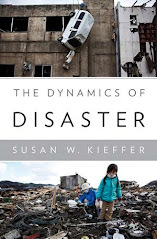 The debris shot with unbelievable speed northward toward the hamlet of Untertal and over and above the creek, for I could see the alder forest by the creek under the stream of shooting debris." 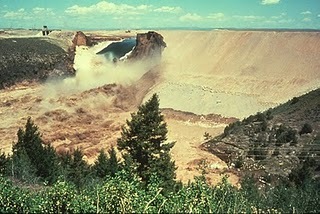 Hsu suggested that the word "sturzstrom", which literally means "fallstream" be adopted to describe these slides and that it be defined as "a stream of very rapidly moving debris derived from the disintegration of a fallen rock mass of very large size; the speed of a sturzstrom often exceeds 100 km/hr, and its volume is commonly greater than a million cubic meters." In spite of the geologic evidence and eyewitness accounts, there is still no general agreement about the mechanism by which the sturzstroms achieve their long runout distances. Shreve (1968) proposed that the avalanches floated over a layer of compressed air; Goguel (1978) proposed that a layer of steam generated by friction allowed the great mobility; Erismann (1979) proposed that friction allowed melting; others (Fineburg, Bagnold, McSaveney, Campbell) proposed various mechanisms related to the behavior of granular flow. Melosh proposed an acoustic fluidization model, in which high-frequency (acoustic) fluctuations in the local pressure around grains relieved the overburden pressure, allowing the material to move even in the absence of a large driving pressure. There is a good tutorial about acoustic fluidization here, the source of the numbered references below. It is possible that different mechanisms operate in different parts of the landslide trajectory. See also this post for more discussion of big landslides. Shreve, R.L. 1968,The Blackhawk landslide: Geol. Soc. America Special Paper 108, 47 pp. Sreve, R.L., 1966, Sherman landslide, Alaska: Science, 154, p. 1639-1643. *Heim, Albert, 1882, Der Bergsturz von Elm: Deutsch.Geol. Gesell. Zeitschr., v. 34, p. 74-115, and/or Buss, E., and Heim, Albert, 1881, Der Bergstruz von Elm: Zurich, Wurster and Cie, 163 p., and/or Heim, Albert, 1882, Bergsturz and Menschenleben: Zurich, Fretz and Wasmuth Verlag, 218 p.
**Hsu, Kenneth, Catastrophic Debris Streams (Sturzstroms) Generated by Rockfalls, Geological Society of America Bulletin, v. 86, p. 129-140, 1975. Goguel, J. (1978) Rockslides and Avalanches, Edited by B. Voight, 1, 693-705, Elsevier, Amsterdam. Erismann, T. H. (1979) Rock Mechanics, 12, 15-46. Fineburg, J. (1997) Nature, 386, 323-324. Bagnold, R. A. (1956) Philosophical Transactions of the Royal Society of London, A, 225, 49-63. McSaveney, M. J. (1978) Rockslides and Avalanches, Edited by B. Voight, 1, 197-258, Elsevier, Amsterdam. Campbell, C. S. (1990) Ann. Rev. Fluid Mech., 22, 57-92. Iverson, R. M. (1997) Rev. Geophysics, 35, 245-296. Melosh, H. J. (1979) JGR, 84, 7513-7520. Melosh, H. J. (1987) Debris Flows/Avalanches: Process, Recognition and Mitigation, edited by J. E. Costa and G. F. Wieczorek, 41-49, GSA. Fluid dynamics helps create the WORLD'S FASTEST PLANT! to the right. (b) is before the trap fires and (c) is after. Note the small hairs on the trap doors, on the right. The scale bar is 500 microns. This is Fig. 1 from the referenced article. 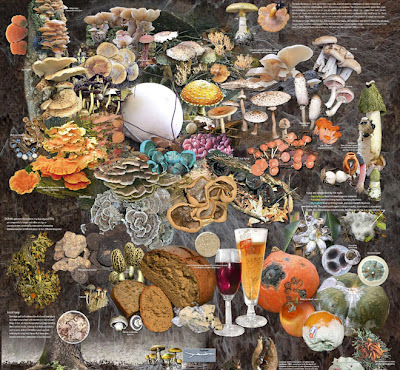 This may be biologic instead of geologic, but it's still cool! In an article of the Proceedings of the Royal Society B, Olivier Vincent et al. investigated how aquatic carnivorous planets catch their prey. Here's a video of a bladderwort doing the catch! Bladderworts have evolved in nutrient-poor habitats, and have become carnivorous as an adaptation. 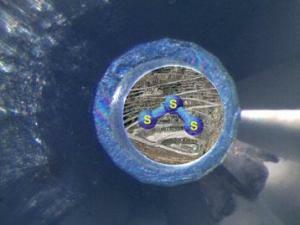 The suction trap mechanism releases stored elastic energy to catch prey. It is a two-phase mechanism. For about 1 hour, the bladderwort glands pump water out of the trap interior. The internal hydrostatic pressure body pressure is lowered, which results in the body storing elastic energy--imagine a fat rubberband that is stretched to become thin, storing elastic energy in the distorted shape. The walls of the trap become concave in shape. A flexible door keeps the entrance closed watertight. There are protruding hairs on the door, which react when touched by the prey. This begins the second phase in which the stored elastic energy is converted into kinetic energy. The trap door opens, the trap wall relaxes and water (with the prey) is sucked in to the digestive chamber, where enzymes secreted by glands dissolve the prey and the nutrients are absorbed by the planet. This release of the trap takes about a millisecond! Pretty speedy for a plant! If the trap is not used, it fires spontaneously after 5-20 hours to reset back to the "ready-to-catch" condition. Vincent et al. then simulated the mechanisms by modeling the trap body and trapdoor as elastic shells with a given thickness, Young's modulus and Poisson ratio. The potential energy is the sum of bending and stretching terms. Essentially, this is the mass-spring system of Physics 101. They then predicted the pressure for door buckling and the duration of the trap inflation. The Young's modulus is 5-20 MPa, comparable to "turgescent parenchymatous tissue." (What in the world is that? !!! Here's a link to a Wiki article on tissue if you feel like sorting that out.) The fast opening and closing of the door, with the dramatic changes in shape of the door, are attributed to an elastic buckling mechanism. Update at 11:00 a.m. on 2/23/11: Dave Petley's landslide blog here has an excellent summary of reasons that this quake was so devastating compared to the higher-magnitude September event. Mid-day, Tuesday, a major earthquake struck 10 km south-east of Christchurch, New Zealand. The focal depth was shallow, only 5 km. 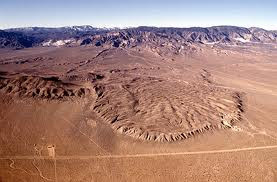 The USGS called it a magnitude 5.5; the press and Geonet are saying that it is a 6.3. 65 people have been reported killed at this time, the toll is likely to go higher, and damage is extensive. There has been at least one strong aftershock. The graph is a preliminary summary of damage, keyed to the Modified Mercalli intensity scale. MM8 (dark orange) is heavily damaged, light orange is damaging, yellow is slightly damaging, and green is strong. The red square marks the epicenter. Click on the Geonet link in the caption to get an updated version of this map. 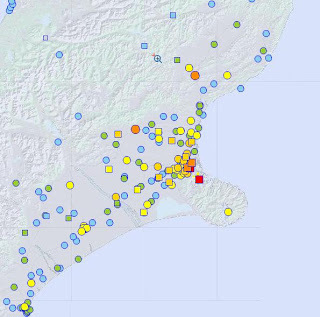 In an earlier post, I discussed the damage caused by the September 3, 2010, M7.1 earthquake, also near Christchurch. A lot of the damage then was caused by liquefaction, and that is likely to be a problem this time as well. Many buildings had been damaged by the earlier earthquake, repairs had not been completed, and so they were vulnerable to the intense shaking that occurred. There is more information on Dave Petley's Landslide Blog, and a good discussion of the geologic setting on Chris Rowan's Highly Allocthonous blog. Information, including some videos, is starting to come in to CNN.COM. 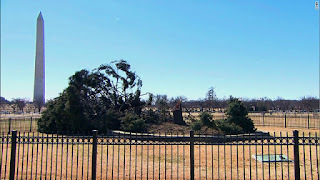 This one shows a bit of footage taken during the earthquake at the very beginning of the video. Our thoughts and sympathies go out to our Kiwi friends. 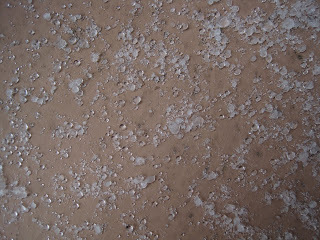 After water, granular materials (such as sand, soil, snow...) are the most common material on earth. We encounter them not only in nature, but in our engineered world: cereals, pharmaceuticals, road aggregate, gravel... Many scientists consider them--after solid, liquid, and gas--to be a fourth state of matter (well, the plasma physicists would argue with that). Granular materials sometimes act like a solid, sometimes like a gas, and other times like a liquid. Modeling their behavior and creating graphic images showing this behavior has been a huge computational challenge. Thousands to millions of grains interact as they flow, and simulating the motion of each grain responding to contact and frictional forces with other grains is computationally prohibitive. In a new paper posted on the WWW site of the university of North Carolina GAMMA group, Narain and others have unveiled a novel approach. The paper is to be published in the ACM SIGGRAPH conference proceedings; ACM is the Association for Computing Machinery; SIGGRAPH seems to mean Special Interest Group on Computer Graphics and Interactive Techniques. Narain et al. assume that the grains are so small that the precise motion of individual grains is unimportant, and they treat a granular material like a liquid, a so-called "continuum model". But, to avoid having the grains flow just like water or syrup, they impose other conditions. The material maintains its volume when at rest, like a pile of sand, but disperses freely when perturbed. In fact, unlike a liquid, there may be no actual surface that defines the material once it starts moving: imagine throwing a ball into a pile of sand. Where does the pile of sand end, and the cloud of ejecta begin? They choose a friction model that can counteract gravity and allow stable piles of grains in equilibrium. The material responds to external forces (such as a push) and internal stresses (contact and frictional forces). Computationally they divide the simulation into two parts: they calculate the motion under the forces present and determine the internal stresses at a particular time. Then, they integrate the motion of the material under these forces. Rather than tracking individual grains, they track moving "clumps" of matter. Check out the video of their simulation results--amazing stuff! Unfortunately, it's a big file and may not play over slow connections. I can play it in my office at the University, but not at home. 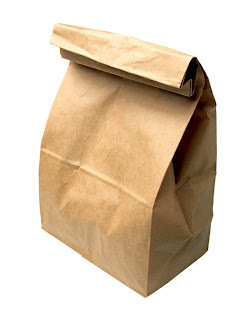 The link is http://gamma.cs.unc.edu/granular/narain-2010-granular.mov if you want to try it some other way. The Feb. 18 issue of Science has images that won the science visualization contest this year. They are also available through Wired magazine here. Titled Fungus Among Us, by Kandis Elliot, Mo Fayyaz at the University of Wisconsin was the first prize winner in informational graphics. Krafla volcano: an accidental encounter (with magma)! Sometimes serendipity provides more interesting science than a rigorous work plan. This was the case when Wilfred Elders and his research team drilled into Krafla volcano, Iceland, in 2009. The purpose of the drilling was to explore the environment of a very hot geothermal resource for use in producing power. The results are reported in an article in Geology (Elders et al., Origin of rhyolite that intruded a geothermal well while drilling at the Krafla volcano, Iceland (Geology, 39, 231-234, 2011), and a news release from NSF. Expecting to find deep magma, at 4.5 kilometers, the scientists instead found magma flowing into their drilled well at 2.1 kilometers! Even more unexpectedly, although the dominant rock at Krafla is basalt (containing 45-50%) silica, the magma that they encountered was rhyolite (containing 65-70% silica). This confirmed the hypothesis that rhyolites can form by partial melting of basalts. Drilling into hot environments, and extracting hot water from them, is extremely difficult for several reasons: any hot water encountered is likely to be laden with minerals that can precipitate out in pipes, and the rocks become very soft. When they reached 2 km depth, the drill bit froze up (would not rotate). When they tried to extract the bit, it became stuck. They found that an intrusion of magma had filled the bottom 9 meters of the well, so they stopped exploratory drilling and converted the well to a production well. The well produced dry steam at a temperature of 400 C (dry steam is water vapor that is heated to temperatures much higher than the boiling temperature at the pressure of the source; wet steam is steam that is in equilibrium with liquid water at the same pressure.) To give you a feel for the potential magnitude of this resource, this steam is hot enough to potentially power 25,000-30,000 homes. 95% of the homes in Iceland are heated with geothermal resources. and the lava is about 100 m below the rim. USGS. The U.S. Geological Survey (USGS) has a permanent observatory on the summit of Kilauea volcano in Hawaii, the Hawaii Volcano Observatory (HVO). 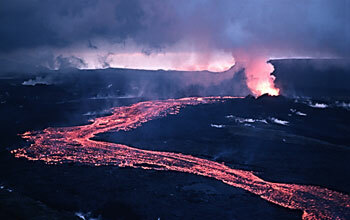 For the past 24 years, Kilauea has been active, with 55 "episodes" of activity spread over these years. Some of the activity has been at the summit, where there is a large crater (small caldera), "Halemaumau", and some activity has been on the flank at a growing cone named Puu Oo (I can't do the Hawaiian symbols for the proper name here). Between 1983 and 1986, Puu Oo built a massive cone, but in 1986 the activity migrated 3 km east, and lava poured out of the east rift zone all the way to the coast. Does anyone know if this movie still exists or is available to the public? NASA has just announced the first X-flare of the new solar cycle. There are three categories of solar flares based on their brightness at wavelengths from 1-8 Angstroms. X-flares are major flares that can trigger planet-wide radio blackouts and long-lasting radiation storms. 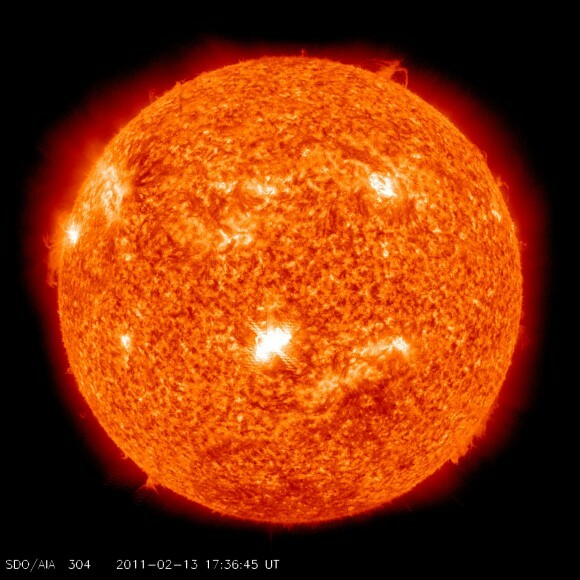 See this article on spaceweather.com for more information about solar flare classifications, and for updates as the flare heads toward earth. This eruption peaked at about 0200 Universal Time (1800 Central Time in the US) on February 15th. This is the largest solar flare in four years. Last autumn, NASA warned that a peak in the solar activity in 2013 could cause serious geomagnetic storms with the potential to knock out electricity grids for days to months. Since this flare also sent a coronal mass ejection (CME) toward the earth, geomagnetic storms are possible when the CME arrives in 36-48 hours, although at the moment the prediction is that it is unlikely that there will be communications problems nor that the astronauts are in danger. Might be some great aurora as well! Here's the link to an earlier article I wrote on "Solar activity (and Newt Gingrich)." 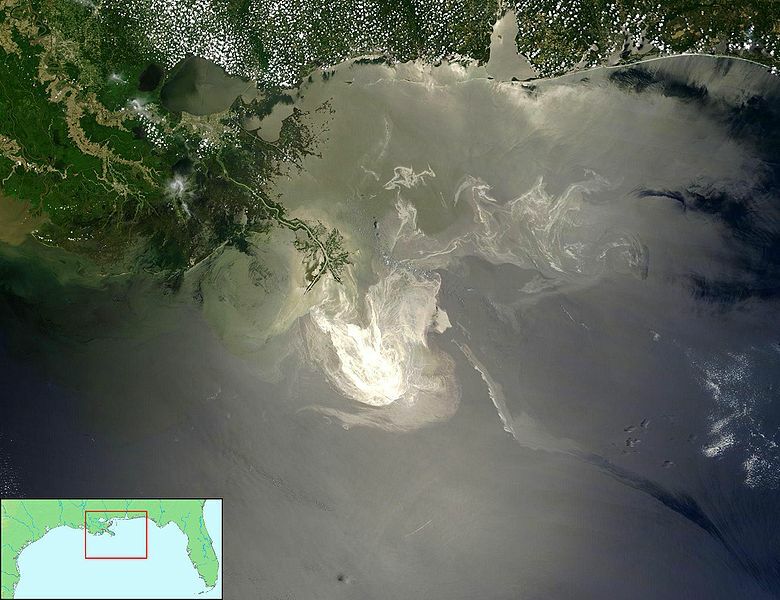 The BP oil well blowout last summer caused release of at least 50-100 million barrels of oil into the Gulf of Mexico. In other units, this was somewhere between 7 and 14 million tons of oil. 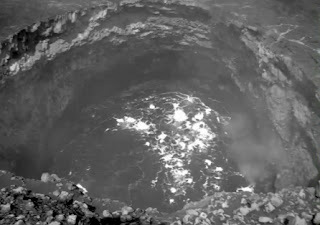 This release was unusual geologically because the discharge rate was high compared to natural rates, it was extended (84 days), and it was deep (nearly 1500 meters). It was also unique because it contained another 40% by weight dissolved hydrocarbon gases, mostly methane and pentane. I featured an article on natural vs. Deepwater Horizon seep rates by Cutler Cleveland on this earlier post. In a paper just released on-line by Nature Geoscience, Joye et al. have quantified this estimate of the amount of gas released, where it was released, and some of the implications. The reference is Nature (published on-line) 13 February, 2011, DOI: 10.1038/NGE01067. (I'll try to remember to come back and put in the formal publication reference!). I really like this paper--the authors dealt with some of the most atrocious scientific units possible to unravel this story: tons (or is it tonnes? ), barrels, bopd's (barrels of oil per day), gallons ('a standard barrel of oil is 42 US gallons or 159 litres), BOE's (barrel of oil equivalent, in energy units of kilojoules or, in volume units, cubic meters or cubic feet),.... Definitely enough to drive an undergraduate chemistry class nuts for a few homework sets! Well done! The bottom line is that hydrocarbon inputs into the gulf were 5,000-10,000 tons of carbon per day from this single well, and that "contrasts starkly" with inputs from natural seepage (220-550 t carbon per day over the entire 70,000 square kilometers of the Gulf of Mexico. The hydrocarbon gases seemed to appear in discrete layers between 1,000 and 1,300 m depth, where concentrations were up to 75,000 times background levels. The ultimate fate of these hydrocarbons is uncertain at present. However, if the geologic record of the past is an indication, it is possible that bacterial activity and consumption of the methane could lead to formation of oxygen-depleted bottom waters. Rhodochrosite is a manganese carbonate mineral, MnCO3, and so it belongs to the family of minerals like calcite, CaCO3. It is a very soft mineral, with a hardness of 3.5-4 on a scale of 10, but it is about three and a half times as dense as ice. Calcium, magnesium and zinc frequently substitute for the manganese, changing the color to lighter shades of red or pink. because it is soft, it's difficult to cut and is rarely used in jewelry. It was first discovered in Romania, where it was found in silver mines. It is the state mineral of Colorado because very large crystals are not common, and some of the best occur in the Sweet Home Mine in Colorado. According to Wiki, the Incas believed that rhodochrosite is the blood of their former rulers, turned to stone, and thus it is sometimes called "Inca Rose." How does rhodochrosite relate to geological fluid dynamics? Searching for an answer to this on the WWW led me to an interesting WWW site on "giant crystals", which has some additional links. Rhodochrosite forms in regions of the crust where warm to hot water circulate to form hydrothermal systems. It often occurs in association with copper, lead, and silver sulfides. In some places, like stalactites in the Capillitas Mine in Argentina, it forms like stalactites, from water dripping through Mn-rich rocks (here's an earlier post on ice stalactites.) As far as I can tell, there is very little published about the Chinese rhodochrosites, and even less on this spectacular sample. Generally rhodochrosite is leached by acid to extract the manganese. In hydrothermal systems, water is rarely pure, but is a salty brine. The water can come from a body of crystallizing magma at depth, or from metamorphic reactions deeper in the crust, or it can originate at the surface of the earth from meteorological processes and then trickle down into the crust where it is heated. There it can dissolve minerals in the rocks and become loaded with interesting cations, such as manganese. Upon circulating back toward the surface, the water can become saturated with these ions because it is cooling, or because it can boils, or because it intersects waters of different chemistry. These changes cause minerals to precipitate. Here's a good Britannica encyclopedia article about mineral deposits. Landsat 5 image May 26, 1992. From this reference. The (British) Telegraph and the New York Times reported today that Namibia has designated its whole coastline as a national park. Becoming the first country to do so, the coastline park joins up with angola's Iona National Park in the north and South Africa's Richetersveld National Park in the south. Namibia has long pioneered the use of tourism to fund conservation and supported its tribal communities to set up conservation areas to promote tourism and keep poaching at bay. The Namib Desert is believed to be the world's oldest desert. One park that is now included in the large park, the Namib-Naukluft National Park, originated in 1907. The area is ever changing, with the coastline advancing in the off shore direction. In 1909 a passenger ship, the Eduard Bohlen, wrecked and crashed ashore. It is now 1200 feet inland from the coast. In the photo above, notice the dunes nearest the coast (toward the bottom left of the photo) pointing in a northeasterly direction, evidence that the coast line is expanding according to this reference. 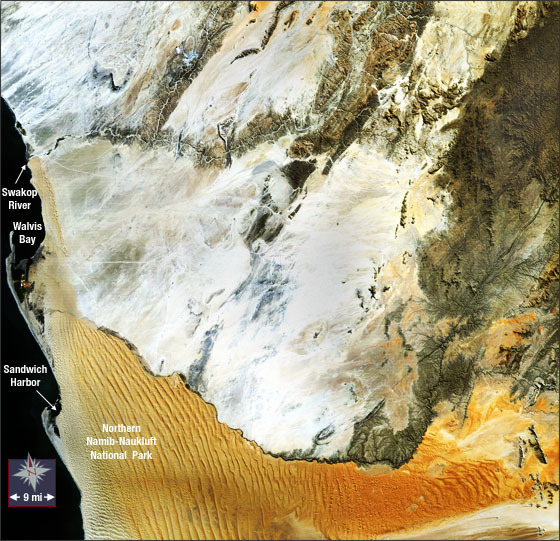 Two spits (at Sandwich Harbor and Walvis Bay) are also evident in the photo. These are formed by interaction between the southwesterly wind and the offshore Benguela Current. 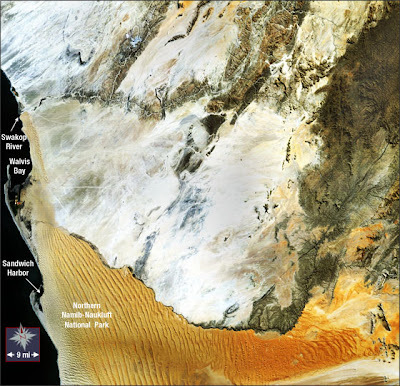 Namibia is famous for its linear dunes, dunes that are parallel to each other as in the left side of the Landsat photo here. Some of the worlds largest are situated here in the Namib sand sea. In 2000, Bristow et al. used ground penetrating radar to investigate the 3-D structure of a linear dune in an effort to figure out how these dunes migrate (Bristow et al., Nature, vol. 406, pp. 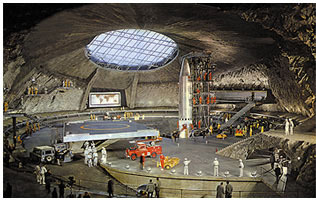 56-59, 2000). 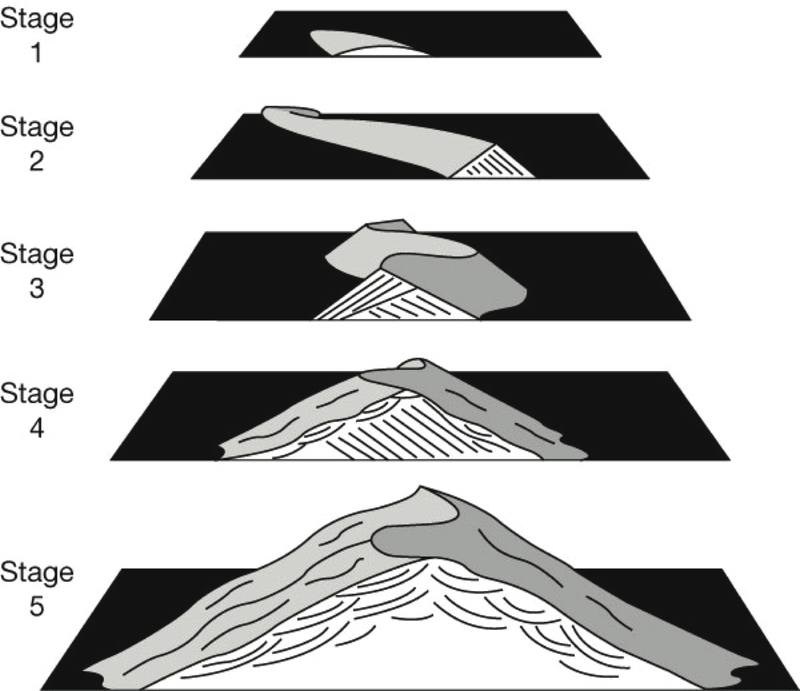 They recognized five stages in the evolution of the dune, illustrated in the Figure: (1) Formation of ripples on the desert sand; (2) Development of a dune with a relatively straight crest. This dune migrates in response to the dominant wind direction, producing planar set beds, called cross-stratification. (3) Development of an instability that results in a sinuous, snake-like crest-line of the dune. The dune is now so big that a single wind season cannot re-sculpt the dune, and it develops a shape that is controlled by more than one wind direction. Now there are two opposing sets of cross-stratification as shown in the illustration. (4) Complex superimposed dunes appear; and (5) Things get really messy!! intersection to take this photo last week! 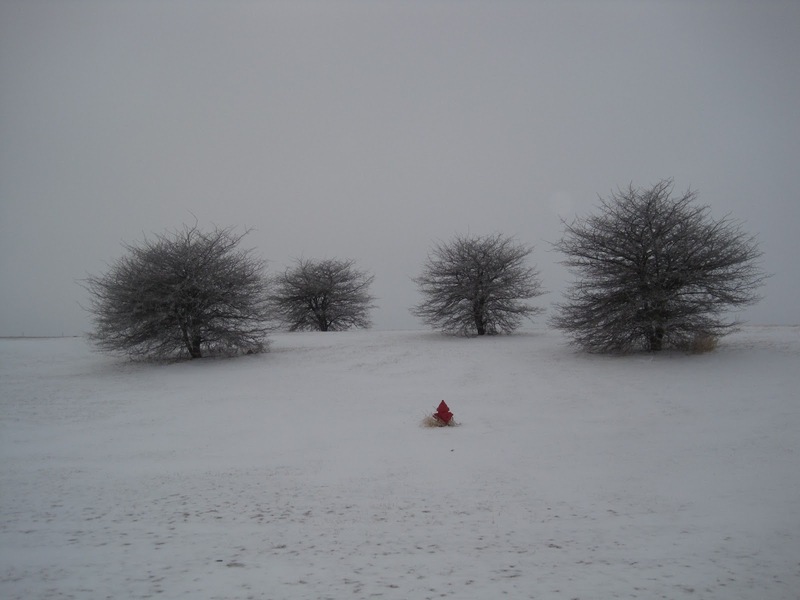 In Illinois, one unofficial meteorological term is "bitterly cold". It is in the forecasts whenever the temperatures drop to single digits, and wind chill factors are in the minus teens to twenties. This made me actually look up how wind chill is calculated. The term "wind chill" was coined by a polar explorer, Paul Siple in his Ph.D. thesis research in which he measured the freezing rate of water under different conditions in trhe Antarctic. He was a member of Admiral Richard Byrd's first Antarctic expedition in 1928. When he was a young child, his family moved to Erie, Pennsylvania (a very cold place), and he went to my alma mater, Allegheny College, graduating with a B.S. in biology. He was the author of four books. He went to Clark University in Massachusetts for grad studies in geography and climatology, doing a thesis "Adaptations of the Explorer to the Climate of Antarctica." With Charles Passel, he hung water-filled, plastic cylinders from a long pole in different conditions in the Antarctic, believing that these simulated heat loss from human flesh. They finished the research in 1940, but it wasn't published in the open literature until 1945 because of potential military applications during the war. They came up with an equation, the Siple-Passel equation" to determine an equivalent temperature under light wind conditions. The coefficients in this equation were refined over 50 years, and then in 2001 it was replaced by the formulation now in use. The model is based on engineering heat transfer from a bare face of a person walking directly into the wind at 1.4 m/s (3.1 mph). where T is the wind chill temperature and T is the air temperature, both in Centigrade. V is in km/hour, measured at a height of 33' off the ground. In this equation the * indicates multiplication, and the ^ indicates that the next number is an exponent (e.g., ^0.16 above). I can't do exponents in this blog program. T = 35.74 + 0.6215*T-35.75*V^0.16 + 0.4275*T*V^0.16. A cool piece of trivia that I found on the Wiki site about wind chill is that it can't be used on other planets! If you did this calculation for Titan, a satellite of Saturn, where the average temperature is -179 C, and wind speeds can be as high as 430 km/h, you get a wind chill of -315 C. This is 42 degrees lower than absolute zero, i.e., impossible! Extraterrestrial sand dunes exist on Mars and Titan. There has been some question about how active the dunes that cover a large region of the northern latitudes of Mars are. Although there have been some indications of small changes, most data suggested that the dunes are currently stable, perhaps held together by ice. However recent images from the HiRISE experiment show substantial changes that are triggered by the sublimation of CO2 as the seasons change. This work is reported by Hansen et al. in Science this week (vol. 331, no. 6017, pp. 575-578, 2011). Sand dunes have a windward side, where the sand is pushed up onto the dune, and a slip face on the lee side. Sand moves on the dunes by saltation (bouncing) and avalanching (called "grainfall" in this Science article). On earth, they have a variety of shapes and, in spite of the differences in climate, have similar morphologies on Mars. Every year, in Mars winter, the polar regions are covered by seasonal caps of CO2 frost. In the spring, when the CO2 sublimates sand grains can move forming the avalanches and dust cloud shown in the figure above. Hansen et al. found that the dunes showed new alcoves, gullies and extension of their aprons. These changes were also remobilized by the wind, forming ripples and erasing the gullies. 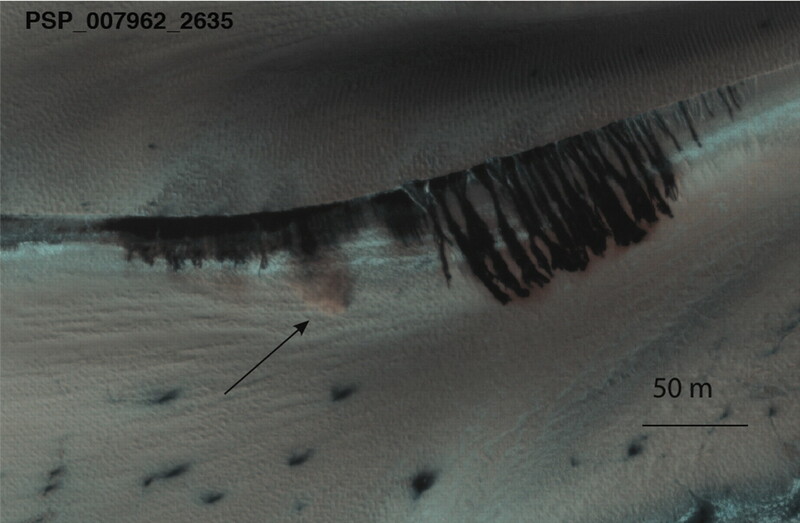 Even if the dunes contain a large amount of ice internally, their surface layers, perhaps to a depth of 25 cm, is dessicated and able to move. A shocking James Bond volcano breaks windows 8 km away! Shinmoedake volcano started eruptng about January 26, and it now joins a few other volcanoes in the world as one capable of producing atmospheric shock waves. Turn up your speakers (well, not too far), play the video on this site, and listen to the shock just a couple of seconds into the video! Assuming that the camera is in the town of Miyazaki, it took the shock about 25 seconds to cover the 8 km (5 mi) from the volcano to the town. So, the process that created the shock occurred well before the eyewitness turned on the recording device. The shock broke hundreds of windows. After I wrote this, I discovered another video that starts earlier and captures the whole eruption sequence; fortunately, my calculation of the shock travel time above seems to be right on! Added on Feb. 7. In this video, you can see the air shock sweeping rapidly down the flank of the volcano in the first few seconds, and you can hear the shock at about 33 seconds. Set from the "You Only Live Twice"
This volcano, in a quieter time in 1967, was the location of the notorious villan, Blofield, and his SPECTRE organization in the movie "You only live Twice", and thus the name that is now appearing in the press, the James Bond volcano. The shock wave that produced the boom you heard in the video did not have a visible presence, only audible. However, visible shock waves at volcanoes were first described at Mount Vesuvius by F.A. Perret who called them "flashing arcs." In his article in the American Journal of Science (volumes 183-184, Article XXXII, pp. 329-333, 1912). From that article: "The frequency of the explosions varied from approximately one every three or four seconds to at least three per second. Although powerful, they were verysharp and sudden in their nature, and at the instant of each--but before it could be sensed by the eye or ear--a thin, luminous arc flashed upward and outward from the crater and disappeared in space. Then came the sound of the explosion and the projection of gas and detritus above the lip of the crater. The motion of translation of the arcs, while very rapid in comparison with that of the detritus, was not above the limits of easy observation and there could be no doubt as to the reality of the phenomenon, which was repeated some hundreds of times. ...of the actual phenomenon, the beauty of which lies in the delicate luminosity, the elegance and perfection of form, and the grace and vivacty of the arcs amid the contrasting color and relatively sluggish movement of their surroundings." Ah, wouldn't it be nice if some of our peer reviewed journals today allowed us to regain some of this style of writing! 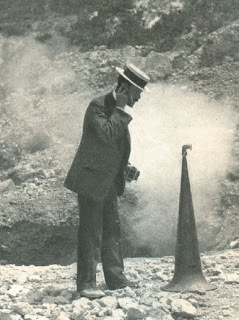 Perret travelled to volcanoes around the world, but it was not until four years later that he saw them again, this time at Vesuvius. After proposing that the arcs were related to sound waves, he concluded "...the flashing arcs may be considered one of the most beautiful of all volcanic phenomena." This posting got me to a wonderful blog by David Bressen on the history of geology, and I'll refer you there "for the rest of the story". The discussion of Perret that accompanies the picture above is on the January 18, 2011, blog. Other volcanoes that have shocks are Ngauruhoe (New Zealand), Sakurajima (Japan), Matua (Siberia), and, just last summer, Eyjafjallajokull. Our local radio station was "on the scene" for a couple of hours this morning with the announcement that a suspicious package had been spotted near a door of the Champaign City building, that traffic had been closed on one of our major streets for a couple of hours, and that the police bomb squad from the University of Illinois were on the scene. Employees were prohibited from entering the building until 9:00 when the situation was resolved. The police can't take chances because the package, a brown bag, could have been lethal, but the Deputy Police Chief seemed to have a sense of humor when he announced that the scene had been "rendered safe" by turning a water cannon on to the brown bag: "The food [someone's lunch in the brown bag] is now in several pieces all over the sidewalk...I have no idea whose lunch it was." So, since this is a fluid dynamics blog (though I may have a bit of trouble relating this to geological fluid dynamics), what is a water cannon? What are they used for? They are used for delivering water at fire scenes, for riot control, and in some commercial sectors, e.g., pressure washing of houses and decks. They were first used on retrofitted tug boats in the mid-19th century, and were subsequently brought on shore for scenes where water is not available, or the fires are unaccessible. Fireboats can pump tens of thousands of gallons of water per minute over distances up to ~100 feet, and up to 400 feet into the air. Fire Boat #2 of the Los Angeles Fire Department can pump up to 38,000 gallons per minute (2.4 cubic meters per second). Water cannons are also used in riot control, as has been reported from Cairo. This practice has been reduced in countries with free reporting media at the scene of riots because the scenes are bad publicity for the police departments. Their use in America was sharply reduced after their use in the mid-20th century to disperse crowds protesting in the Civil Rights Movement. There have been experiments including both tear gas and dyes into the water stream, so sometimes you'll see pink, purple, or green jets. These are meant to make rioters more identifiable to the police on the scene. It was difficult to find any specific numbers for the pressure in the jets, or the force that they exert on people in crowds. Industrial use machines advertise pressures >3000 psi, 200 bars (200 times atmospheric). One reference I saw for riot control water cannons mentioned 30 bars. These pressures can do severe damage to humans. It only takes about 1 bar of overpressure to rupture an eardrum. Relevance to geology? High speed water can exert incredible forces on rock. Niagara Falls, which lies between Lake Ontario and Lake Erie, is 180 m high.. Water in free fall over Niagara Falls could theoretically reach 73 mph; velocities up to 68 mph have been measured. The stagnation pressure of water at these velocities is about 5 bars. Water landing on rocks with this much pressure--especially if it carries abrasive sediment--exerts a strong force on the rocks, causing them to break up and then transporting them away. 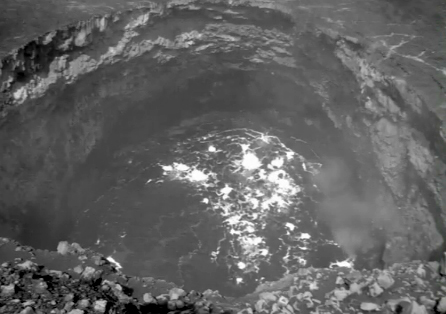 There is a scour hole >100 feet deep under the Falls! 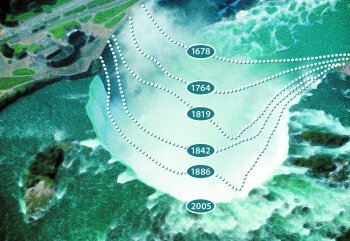 This scouring + transport process has caused Niagara Falls to retreat towards Lake Erie about 11 km in the past 12,000 years, or a rate of about 0.1 mm/hour! A very nice pdf of scouring at bridges and erosion by water can be found here. Reports tonight are that there was over 3.5 billion AU$$ damage from Yasi, and one loss of life. Here's a photogallery of some of the damage. Our hearts go out to our Aussie friends. Monster storms: Australia and U.S. In the previous post, I discussed the huge cyclone in Australia, but I thought our readers would be interested in comparing and contrasting with what is going on in the US this week. The images aren't directly comparable because they are taken with different instruments, and the destructive potential is in now way reflected by these maps, but "you get the message: these are big storms!" The image at the left is the largest storm that has hit the U.S. since the 1950's. 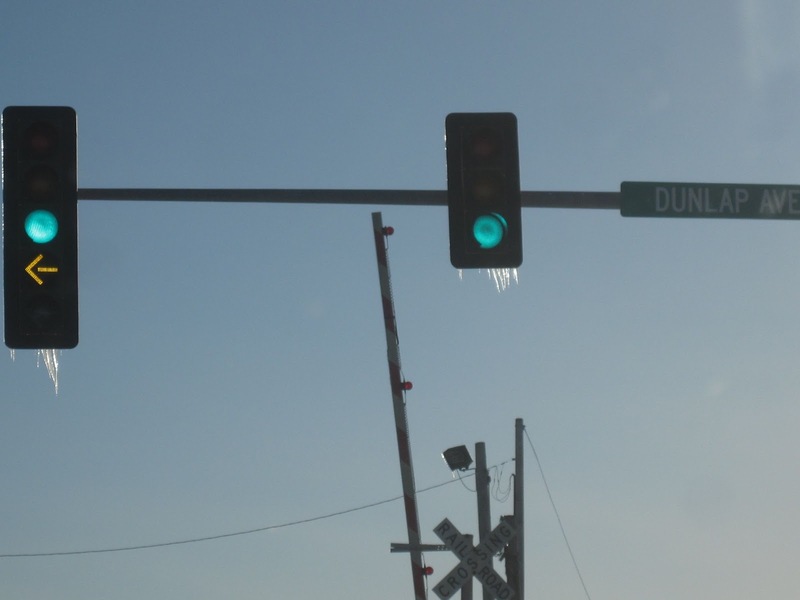 It's been affecting 30 states with snow, sleet, freezing rain and rain. 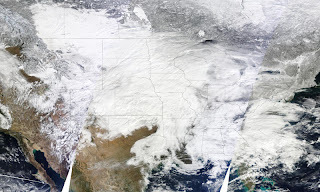 This image was compiled from three images, captured on Jan. 31 at 10:30, 12:05 p.m. and 1:45 p.m. Eastern Time to form the mosaic shown here. Sensors did not collect data in the white gaps. More infomation is here. Factoid: A cyclone is an atmospheric system characterized by rapid inward circulation of air masses around a low-pressure center. Cyclones circulate counterclockwise in the Northern Hemisphere, and clockwise in the Southern hemisphere. In the Atlantic, cyclones are called hurricanes; in the Pacific, typhoons. 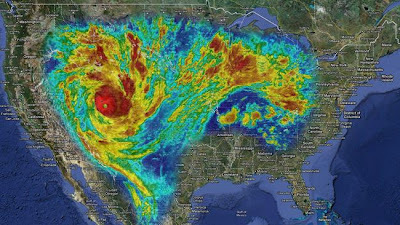 Q: Is there an upper size limit to how big hurricanes can get? Could there theoretically be a hurricane that is, say, twice or three or ten times the size of Katrina? Q: Is there a upper size limit to how big hurricanes can get? Could there theoretically be a hurricane that is, say, twice or three or 10 times the size of Katrina? Shepherd: There is likely an upper size limit on hurricanes before they become unstable, but I can't quote you a magic number as this would be a theoretical study that would have to be done with a model. Even with category 5 storms, we see a point at which they cannot sustain such intensity for long periods of time. The storm will go through various eyewall-replacement or other weakening processes. Additionally, the upper level wind environment and ocean surface temperature/roughness processes are so dynamic that nature has imposed a self-regulating mechanism on the storms. 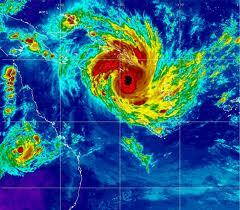 Cyclone Yasi bearing down on Australia--TAKE CARE AUSSIE FRIENDS! Comments added 02/02/2011: The core of Yasi is expected to take four hours to pass over an area, a measure of the size of this cyclone. It will last 3 days, and still be a category 1 storm (winds up to 125 km/hour) when it is 900 km inland. More than 89,000 people in north Queensland have lost power. The storm tide in Townsville is reaching the 3 meter mark, with expected surges of 7 m. For a discussion of the impact of this to Australia's economy, see Businessweek.com. Here is a link to a good NASA Earth Observatory image. Cyclone Yasi is now a larger-then- Katrina-sized storm bearing down on Queensland's tropical coast, expected to make landfall in the early hours of Thursday a.m. (Australia time; Brisbane is 16 hours ahead me at US Central Daylight Time). It follows on the heels of Cyclone Anthony which left Queensland drenched not long ago. For a set of superpositions like the one below showing Yasi compared to Europe or Asia, go here. Yasi is currently over the warm waters of the Coral Sea. These provide energy and water into the cyclone just as the warm waters of the Gulf of Mexico provided fuel for Hurricane Katrina. Here's a good tutorial on tropical cyclones in the Atlantic--just reverse directions for the southern hemisphere! Yasi was upgraded to a Category 5 storm at 5:00 am AEDT. It was about 650 km E-NE of Cairns and 650 km NE of Townsville. It is moving W-SW at 30 km/h. Coastal residents between Port Douglas and Townsville are warned of an "extremely dangerous" storm tide, with flooding inland. This storm unfortunately is only weeks after the last episode of severe flooding in Queensland. Gusts reaching 280 km/h are expected in some regions in the evening. Unfortunately, the peak of the storm will hit Cairns in the dark, about 10:00 in the evening. The Australian Defence Force has evacuated hundreds of patients from two hospitals in Cairns. Trivia: 280 km/h is 77 m/s. The speed of sound in air is 340 m/s. These winds would have a Mach number of 0.23, not trivial!! Unfortunately, Yasi is going right over Australia's famed Great Barrier Reef. The projections are for hurricane force winds and sea swells greater than 6 meters. Coral reefs growing in cyclone areas suffer periodic damage from the waves and storm surges. They can be broken and wiped out down to a depth of 20 m, with the branching colonies being much more susceptible to breakage than the more massive forms. The reefs can also be damaged by the sheer influx of freshwater from the storms. According to the local Cairns news, "Yasi is expected to be Queensland's worst cyclone, covering something approaching twice the physical size of Cyclone Lary, which devastated the Innisfail region in 2006, causing 1.5 billion AD in damages. For other posts on this blog about the Australian weather, here's "Santa Never Made it into Darwin", and Inland Tsunami. The Santa post has Super Typhoon Tip for comparison to Yasi. Geology.com has a really interesting article today about Frazil ice. 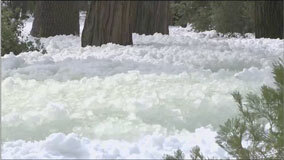 The National Park Service video that you can access from this site has an excellent description of this form of ice. Since we're in the midst of two days of ice storms here in central Illinois, it's appropriate to feature ice! Water normally freezes at 273.15 K (32 F), but can be supercooled down to almost 231 K if there are no nuclei for the ice crystals (that is, the water needs to be very pure). Frazil ice forms in turbulent, slightly supercooled water. It consists of small discs of ice 1-4 millimeters in diameter and 1-100 microns in thickness. It is estimated that sometimes there can be one million ice crystals in a cubic meter of water. As the crystals grow, they will stick to objects in the water and tend to accumulate on the upstream side of objects. This can cause ice dams and serious flooding. In the NPS video mentioned above, you can see Yosemite Creek change directions in response to the movement of the frazil ice. Frazil ice in rivers can be a serious problem if there are hydroelectric facilities because it can block turbine intakes, or can freeze open gates. It's also hard on the fish! In the ocean, frazil ice forms around the edges and within open water within ice packs. Here it has become of concern because of oil and gas development in the Arctic. A review article on this by Sellye Martin can be found in Annual Reviews of Fluid Mechanics, v. 13, pp. 379-397, 1981.) 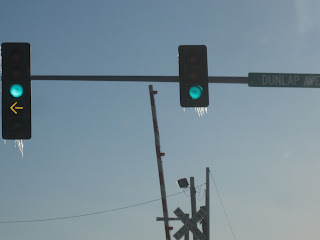 Other posts on ice on this blog are Boiling water turns to snow, Freezing rain in southeast U.S., Comet Hartley 2 and a cosmic snow storm, ice stalactites, and Hail, hail. As of today, this site has had visitors from 66 countries!! Many of you live in places that are a lot warmer than here, so I thought that I'd post a couple of pictures below of our winter weather! "Trees plus fire hydrant" was taken about a week ago. Yesterday and today we've had a storm of ice pellets. The world is covered with about a half-inch of them! Since we also had freezing rain, the pellets have solidified into a solid mass that I can easily walk on top of. The photo shows these little spheres in a sheltered place on my front porch. This form of winter precipitation forms when there's a layer of air above-freezing point between one and two miles high in the atmosphere, and sub-freezing air both above and below it. Snowflakes formed above this warm layer melt when they fall into it, and then refreeze as ice pellets when they hit the subfreezing layer below it. If this lower warm layer is too small, the droplets may not completely refreeze and the precipitation then falls as freezing rain. Nasty stuff!